There are days when I have lots of extra time in the morning (or the afternoon, for that matter) to prepare and savor a full pot of coffee. I know that I’m not the only one who sometimes face a time crunch, either, since K-cups and drive-thrus are much more popular coffee options than siphons are. So, I’m always on the lookout for coffee gadgets that will make better coffee more easily and one I picked up recently was the Healthy Steps Single Serve Coffee Press. This little gadget looks like a tea infuser, but is actually a french press that makes one mug full of coffee at a time. 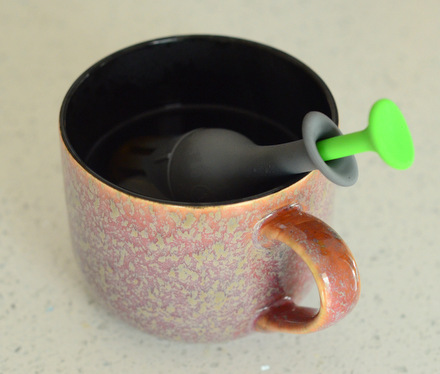 The gadget holds about 2 tbsp of coffee (they recommend using 1 1/2 tbsp on the instructions) and it is simply set in a mug of very hot water to brew for 4 minutes. At the end of the brew time, the plunger is pushed down to force any remaining water through the grounds before serving. The gadget is very easy to use and clean, partly due to smart design and partly due to size. You can see the coffee brewing while you wait, but I found that I needed to push the plunger down repeatedly to get the brew strength up to a reasonable level. Stirring the infuser while the coffee was brewing helped circulate the water and produced a better brew. I found that the coffee wasn’t quite as good as when I made it with a traditional french press, largely because I was limited in the amount of grounds that I could add (and thus either the size of my coffee serving – which I capped at 8 oz for this tool – or the strength of my coffee) at one time. That said, it did an excellent job of containing the grounds and outperformed many of the more expensive single serve french press tools I’ve tried. This is small and lightweight, not a bad little tool to have you in your kitchen for times when you want a quick coffee fix.